Reply, 'For Mrs Neilson in answer to Sir Alexander Douglas Bart'.. 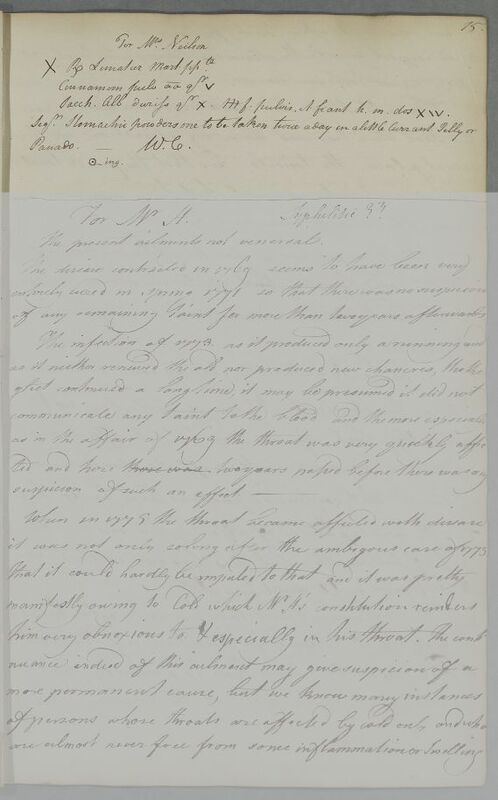 The very neat case-book entry has been annotated with the numbers '2' and '1' above parts of the opening text and with a dot within a circle at the end of the letter followed by 'ing'. Although they suggest the type of editorial markers found n some of Cullen's retained drafts, the precise significance of these particular additions is obscure. 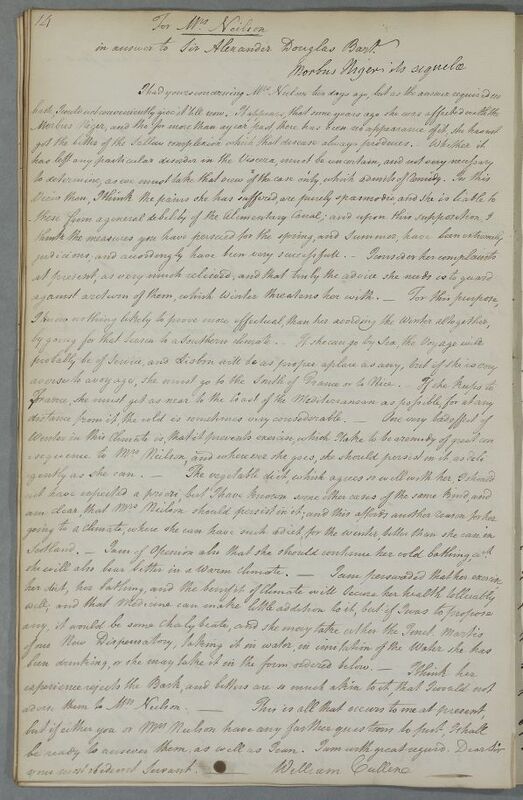 Summary Reply, 'For Mrs Neilson in answer to Sir Alexander Douglas Bart'.. The very neat case-book entry has been annotated with the numbers '2' and '1' above parts of the opening text and with a dot within a circle at the end of the letter followed by 'ing'. Although they suggest the type of editorial markers found n some of Cullen's retained drafts, the precise significance of these particular additions is obscure. Case of Mrs Neilson who has had a 'morbus niger'. in answer to Sir Alexander Douglas Bart. any, it would be some Chalybeate, and she may take either the Tinct. Martis. be ready to answer them, as well as I can. 1: For his and subsequent added marks see main note heading this document. 2: See Pharmacopoeia Collegii Regii Medicorum Edinburgensis (Edinburgh: 1774), p.79. Scotland. - I am of Opinion also that she should continue her cold bathing, wch. Sacch. Alb. duriss qs X. ℳ F. pulvis. et fiant. h. m. dos. XIV.